Necrotizing fasciitis is a rare condition. Due to the agressivity of the infection and the amputation rate, it is very important to be aware of this diagnostic and do a proper surgical debridement. We describe a clinical case of a patient with a necrotizing fasciitis that needed two fingers amputation. After the antibiotic treatment and a second surgical debridement we performed a skin graft. The follow up at 6 months show a good function of the hand. The prognosis of necrotizing fasciitis depends on the timeline of care. The disease consists of an infection of the superficial and deep fascia and spreads very quickly [1-3]. The hand, which is commonly exposed to wounds, is a major gateway for the infection (Figure 1) . 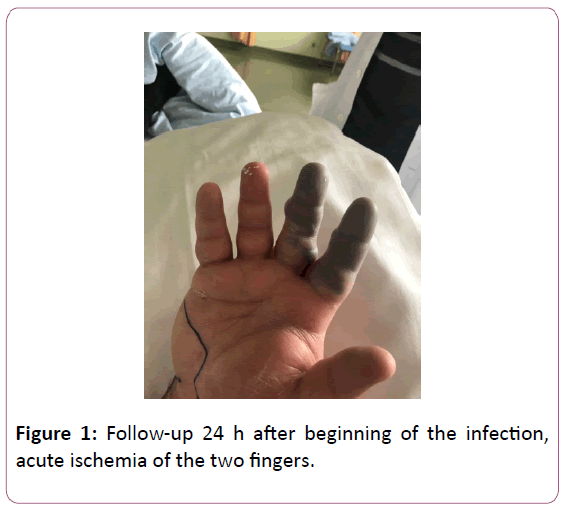 Figure 1: Follow-up 24 h after beginning of the infection, acute ischemia of the two fingers. Hand surgeons must continuously be on the lookout for a diagnosis of this severe infection . Caused by gram-positive bacilli (most often group A beta-hemolytic streptococcus), necrotizing fasciitis may be polymicrobial or monomicrobial (Figure 2A and B) . 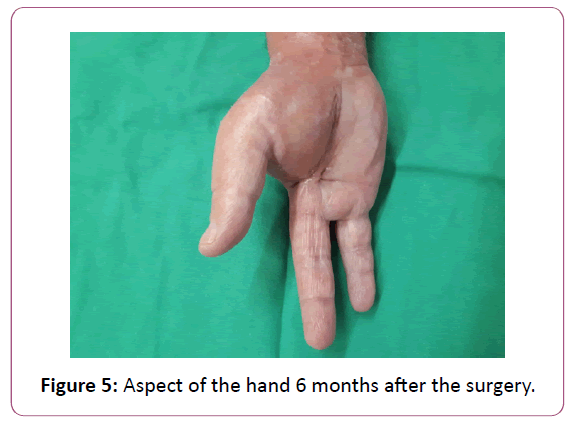 Figure 2: (A, B) Follow-up after surgical debridment and 2 fingers amputation. Early recognition and aggressive surgical debridement are most important. Current amputation and mortality rates continue to be high [1,5]. Through a case discussion, we will reiterate the tools available for diagnosis and surgical treatment. The case concerns a 52-year-old patient, typically in good health, who, as a result of lesions caused by eczema scratching, presented with wounds on the 5th finger of the right hand in zone 2 of the palm. He presented at the Emergency Room with erythema and swelling of the hand. Interdigital blisters were observed at the base of the second and the third finger (Figure 3A and B). The patient had a CT scan performed, which did not show any deep collection. Figure 3: (A, B) Follow-up after skin graft. He was thus hospitalized in our department for IV antibiotic therapy with a diagnosis of cellulitis. 24 hours later, the patient presented with acute ischemia of the 2nd and 3rd fingers. His LRINEC score was 6 (CRP >150 mg/L, WBC 18, Hemoglobin 13 g/dL, Sodium >135 mmol/L, Creatinine <141, Glucose <10). Given the poor clinical progress, emergency surgical treatment was arranged. In the operating room, skin, skin tissue, and fascia were resected. The material was sent to pathology extemporaneously. The results came back positive for necrotizing fasciitis. In this context, all of the skin on the back and palm of the hand was removed and the two ischemic fingers were amputated. Surgical revision was planned 48 hours later to confirm satisfactory local progress and to check the resection margins. We also resected the bones of the second and third metacarpals for a better functional result. In the meantime, the patient was given IV antibiotics with co-amoxicillin and clindamycin. Bacteriology testing came back positive for group A streptococcus pyogenes. We then placed a VAC dressing and the patient had a thin skin graft placed, which covered the entire initial debridement area. At six-month follow-up, the patient’s skin had healed properly and he had adjusted to using his hand. Clinically, he had a Kapandji score of 10, a Jamar test was 44% as compared to the other side. He had resumed work. In our clinical case, we first considered cellulitis; given the poor clinical progress, a diagnosis of necrotizing fasciitis appeared. A delayed diagnosis is normal for this infection [1-5]. Wong et al. created the Laboratory Risk Indicator for Necrotizing Fasciitis (LRINEC score) to guide our diagnosis. This score accounts for CRP, WBC, hemoglobin, sodium, and creatinine levels. A score >6 has a PPV of 92% . In our case, a CT scan was performed in search of a deep collection but, ultimately, it only delayed surgical treatment. Several series in the literature [8,9] have studied the role of a CT scan in this disease. McGillicuddy et al. established an imaging-guided score out of 5 (Figure 4). Figure 4: X-ray showing the metacarpal amputations. Edema of the fascia and muscles equates 4 points, fluid tracking 3 points, lymphadenopathy 2 points and subcutaneous edema 1 point. For a score >6 the sensitivity was 86%, specificity 92%, PPV was 63%, and NPV was 86%. Some authors studied MRI [11,12], and concluded that it is difficult to differentiate between diagnoses of necrotizing fasciitis and a soft tissue infection (Figure 5). Figure 5: Aspect of the hand 6 months after the surgery. In the presence of clinical suspicion, erythema, heat, crepitus, and rapid progress, a laboratory score  can help but no imaging procedure is indicated; furthermore, it is important to avoid wasting time and consider surgical treatment instead. Our patient had two debridement procedures performed before a VAC dressing (Negative Pressure Wound Therapy) was placed. In the literature, most series identify an average of two debridement procedures per patient, an amputation rate of approximately 20%, and a mortality rate of approximately 20% . In our case, we had to amputate two fingers and perform a bone resection of metacarpals 2 and 3. VAC therapy is discussed in the aftermath of necrotizing fasciitis . It isolates the wound, decreases the nursing time needed to care for the wounds, and increases patient comfort. Once granulation was sufficient, we performed a thin skin graft as opposed to a flap. This procedure is easy, fast, and, given the context of infection, seems safer. At his six-month follow-up appointment, our patient’s skin had healed properly, and he had adjusted well to everyday life. This result required specialized care involving a hand surgeon, infectious disease specialist, occupational therapist, and physiotherapist. Necrotizing fasciitis of the hand is a rare disease; given the functional impact and the high risk of amputation, it must be considered when diagnosing a severe infection. Treatment involves surgery with a large debridement and amputation if needed. VAC therapy helps granulation tissue form before performing a definitive skin procedure to cover the skin. Aakash C, Michael DW, Bradley P (2014) Necrotizing fasciitis. J Hand Surg Am 39: 1598-1601. Chin-Ho W, Yi-Shi W (2005) The diagnosis of necrotizing fasciitis. Curr Opin Infect Dis 18: 101-106. Rukshini P, Jason Chan M, Shanker P (2009) Necrotizing fasciitis. Can Fam Physician 55: 981-987. Koshy J, Bell B (2018) Hand infections. J Hand Surg Am. Lucas S Mc D, Mary B, Eric H, Leo K (2011) Hand infections. 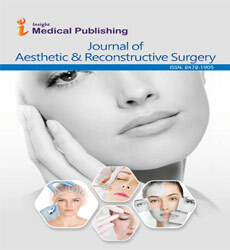 J Hand Surg 36A: 1403-1412. Jinn-Ming W, Hwee-Kheng L (2014) Necrotizing fasciitis: eight-year experience and literature review. Braz J Infect Dis 18: 137-143. Chin-Ho W, Lay-Wai K, Kien Seng H (2004) The LRINEC (Laboratory Risk Indicator for Necrotizing Fasciitis) score: A tool for distinguishing necrotizing fasciitis from other soft tissue infections. Crit Care Med 32: 1535-1541. Wysoski MG, Santora TA, Shah RM, Friedman AC (1997) Necrotizing fasciitis: CT characteristics. Radiology 203: 859-863. Nikos Z, George CV, Hmed S, Hasan A (2010) Diagnosis of necrotizing soft tissue infections by computed tomography. Arch Sur 145: 452-455. Gillicuddy EM, Andrew L, Kevin S, Lewis K, Adrian M (2011) Development of a computed tomography-based scoring system for necrotizing soft-tissue infections. Injury, Infection and Critical Care 70: 894-899. Ali SZ, Srinivasan S, Peh WCG (2014) MRI in necrotizing fasciitis of the extremities. Br J Radiol 87: 20130560. Kim KT, Kim JY, Wan Lee J, Kim JY (2011) Can necrotizing fasciitis is differentied from nonnecrotizing infectious fasciitis with MR imaging? Radiology 259: 816-824. Wen-Shyan H, Shan-Chin H, Chun-Sheng H (2006) Use of vacuum-assisted wound closure to manage limb wounds in patients suffering from acute necrotizing fasciitis. Asian J Surg 29: 135-139.